Congratulations, your baby has reached yet another milestone, starting solid foods. Before you begin adding cereal and pureed fruits and vegetables to her diet, you’ll want to compile a shopping list. 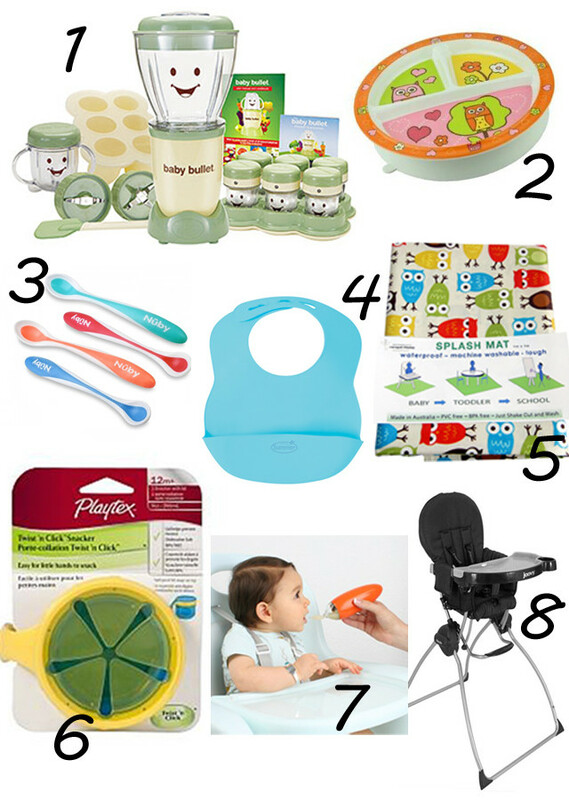 These must-have items will help your infant get off to a very messy start. This 20-piece food prep and storage set will become your right hand in the kitchen. You can whip up nutritious meals in minutes and puree batches to freeze. The kit includes multiple blades, stay-fresh lids, date dial storage cups, a recipe book and pocket nutritionist. We found a bib that will make you want to ditch your cloth bibs. The molded pocket collects crumbs, drips and spills, it quickly wipes or rinses clean and can be rolled up for packing. Its flexible material is soft against baby’s skin and the neck adjusts to grow with the child. There is no risk of burning your child’s mouth when feeding them with these rainbow-hued utensils. The spoon’s head turns white when it comes in contact with food that is too hot. The tip is gentle on teething gums, and mom and dad will find the soft, rubbery texture easy to grip. This spoon and container two-in-one makes one-handed feeding a breeze. Squirt single bites from the bulb-shaped end onto the spoon and replace the cap when mealtime is finished. It’s PBA-, phthalate- and PVC-free and safe for the dishwasher. It had us at “Sugarbooger.” The eight-inch, non-toxic melamine plate is available in 21 charming patterns and comes with a (detachable) suction base, which comes in handy when you’re little guy decides it’s funny to repeatedly toss the plate across the dining room. Tiny hands can wiggle out Cheerios without spilling them or hurting their digits. This snack trap has an audible click that signals when the lid is sealed and is perfect for families in transit. Plus, it’s tough enough to survive frequent drops to the floor. This machine washable mat is handmade in Australia and covers a lot of real estate underneath a high chair (40" x 40" or 40" x 55"). The sturdy laminated cotton will withstand many messes as your child transitions from baby to toddler to school age. An uber-modern design means comfort and support for pint-sized ladies and gents. It features an easy-to-clean leatherette seat, a handy removable swing tray and secure five-point harness. It’s lightweight frame folds in half for easy storage and transport.